Did you guys enjoy the first gift guide last week? It featured all kinds of great gift ideas for the hostess, as well as a variety of other housewarming gifts for the holiday season. This week I thought we’d tackle the jetsetter. 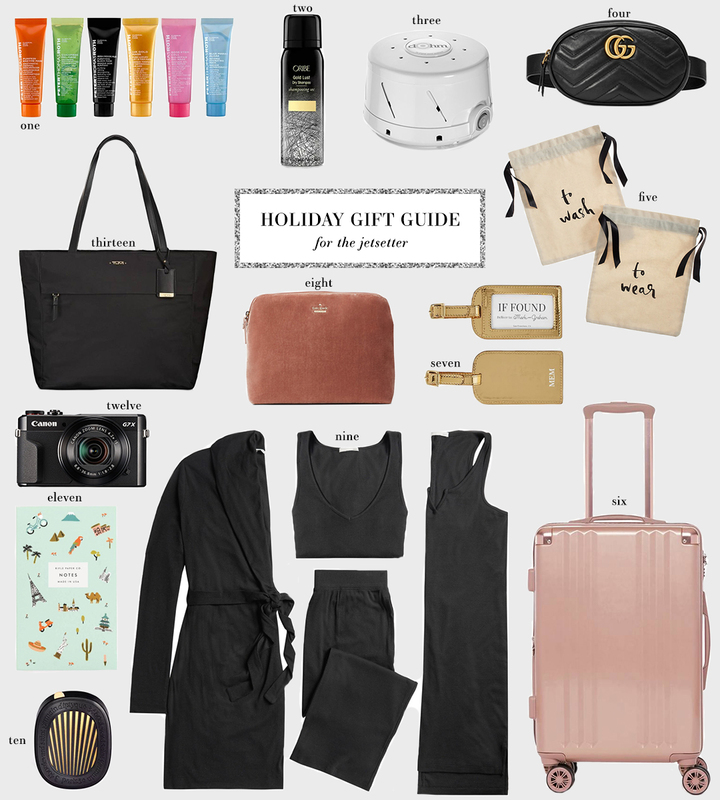 Whether it’s a friend who is constantly traveling for work or the woman with wanderlust in your friend group, any of these present picks would be a surefire hit. Check back here for another gift guide next Thursday, and don’t forget to hit up The Holiday Shop! This alpaca cape is such an effortless topper for any occasion! Go from your flight straight to lunch or sightseeing. Definitely a great travel staple to have on hand. I haven’t pulled the trigger on these yet, but my mom just raves about them! This gift is great for anyone really. For the lady who loves weekend road trips and getaways, you’ll be amazed at how much you can fit in this chic weekender. Watch the video to find out! Get this passport cover monogrammed for a simple and budget-friendly gift under $100! For an easy and useful gift under $50, get them this portable bluetooth speaker. I always travel with mine! It’s the size of your palm and the speaker is very powerful. One of my most beloved travel staples is my Club Monaco trench. So chic, comfortable and looks gorgeous over any outfit! Turn your iPhone into a professional camera with these smart clip-on lenses. So cool! Traveling does a number on your skin, so this Skin Hangover Emergency Kit is a great thing to have on hand if you travel a bunch! These are great gifts for a traveller! How cute is that rose gold luggage!